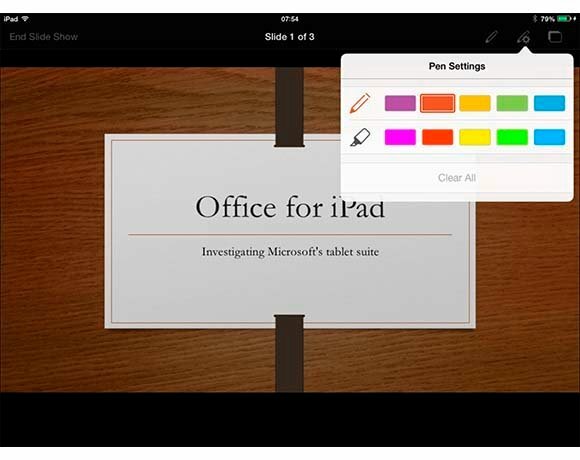 PowerPoint for iPad: Selecting a pen style for a PowerPoint slide show - Test drive: Is Microsoft Office for iPad a strong start for mobile Office? PowerPoint for iPad has a projection mode, even in the free version. In projection mode, you can enable a virtual marker pen for scribbling on your presentation. When editing, you can add and edit slide transitions, add notes but not comments, and edit graphics and text. A limitation is that video and audio content is not supported.